The ring finger represents your spouse. The little finger/pinky represents your children. Hold your hands together like the picture. Join your middle fingers back-to-back, and the remaining fingers tip-to-tip. Now, try to separate your thumbs. They will separate because your parents are not destined to live with you forever. Rejoin your thumbs and separate your index fingers. They will separate because your siblings will have their own families and lead their own lives. 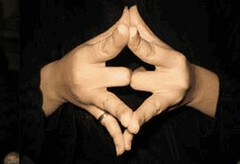 Rejoin your index fingers and separate your little fingers/pinkies. They will separate because your children will grow up, get married, and settle down. Rejoin your little fingers/pinkies and try to separate your ring finger. They will not be able to separate because your spouse is meant to be with you throughout your entire life, through thick and thin. (Re-posted from a friend’s Facebook page). Next The First Day of Advent!